Becoming a vet is a second career for Petrosky, who first trained and worked as a scientist. After obtaining a Ph.D. in biophysics from the University of California, San Francisco, in 2006, Petrosky and her husband, a fellow graduate student at UCSF, moved to Basel, Switzerland, home of the drug maker Novartis. There she helped to perfect a laboratory technique for testing the effects of a new osteoporosis drug on living tissue samples. Sometimes she would set her alarm for 3 a.m. to study while the rest of the family slept. “Keiko has such enormous energy and organization. I was in awe of how she managed veterinary school with research projects and family,” says Barbara Davis, a former pathologist at Tufts who was her advisor on a research project on dog tumors, for which Petrosky received a Morris Animal Foundation Veterinary Student Scholarship. Early on at the Cummings School, Petrosky found a small group of career-changers and students with young children who leaned on each other for support and shared creative studying strategies. 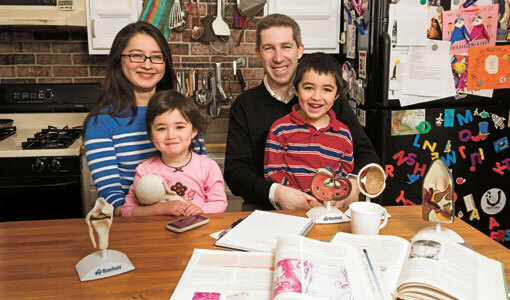 “I learned to make up bedtime stories for my son about how the kidneys or heart worked,” she says. Between her first and second years, Petrosky took a year off for the birth of her second child. When she resumed classes, she got a boost from the American Association of University Women, which awarded her a $12,000 career-development grant to help pay for child care. While there have been plenty of sacrifices, Petrosky says it’s paying off. In September, she’ll start a residency in veterinary pathology at the New England Primate Research Center at Harvard Medical School, where she will work on methods for treating diseases that occur in animals and humans. One of her favorite parts of clinical rotations was watching her kids’ faces light up when she would show them cell phone pictures of a turtle, cow or dog she had helped heal. “At the end of the day, those little things helped get me through,” she says.